The journey from being an unknown horse trainer in Australia to one of the most renowned clinicians in the world was not easy. But Clinton's dedication to becoming the best horseman he can be and his desire to help people have better relationships with their horses has never wavered. 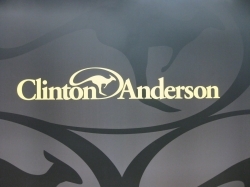 Today, Clinton and the Downunder Horsemanship Method have helped thousands of horses and riders, and Clinton is committed more than ever to inspiring the dreams of horsemen. This is the story of Clinton Anderson – a clinician, trainer and competitor.